It was America's deadliest battle ever, with 26,000 U.S. soldiers killed, tens of thousands wounded and more ammunition fired than in the whole of the Civil War. The Meuse-Argonne offensive of 1918 was also a great American victory that helped bringing an end to World War 1. ROMAGNE-SOUS-MONTFAUCON, France (AP) — It was America’s deadliest battle ever, with 26,000 U.S. soldiers killed, tens of thousands wounded and more ammunition fired than in the whole of the Civil War. The Meuse-Argonne offensive of 1918 was also a great American victory that helped bringing an end to World War 1. 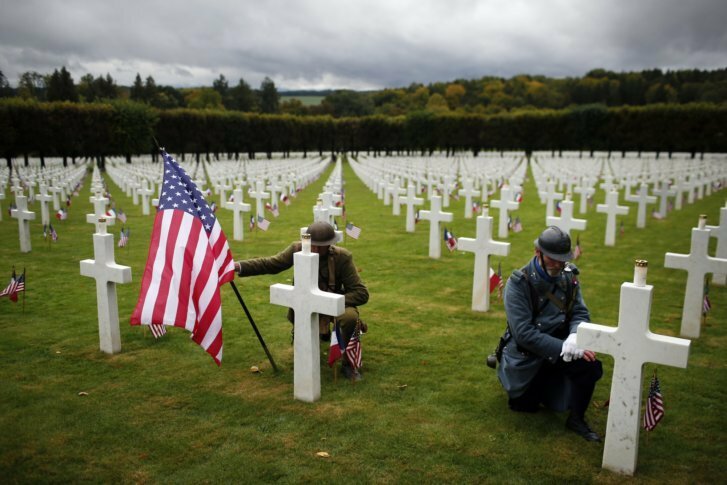 Officials, descendants of soldiers and visitors have braved strong winds and rain to attend a remembrance ceremony on Sunday afternoon in the Meuse-Argonne cemetery, which is surrounded by green fields and forests in Romagne-sous-Montfaucon, a village in northeastern France. All day, volunteers have read the soldiers’ names aloud, to honor those who sacrificed their lives for liberty, freedom and democracy. Covering 52 hectares (130 acres), Meuse-Argonne is the largest American cemetery in Europe. Organizers were forced to cancel the planned lighting of 14,000 candles because of the bad weather. Gerald York, grandson of World War I hero Sgt. Alvin York, praised a “beautiful commemoration”. “The weather’s a little dreary, but that’s the way it was 100 years ago for the battle. So we’re kind of getting a view of what they did, what they fought in and the conditions they had to endure,” he said. His grandfather earned the Medal of Honor for his efforts during the Meuse-Argonne battle. Sgt. York led an attack on a German machine gun nest, killing at least 25 enemy soldiers, and capturing 132 Germans. William M. Matz, secretary of the American Battle Monuments Commission (ABMC) that maintains the site, told The Associated Press that this piece of history must be retold to younger generations. “I think it’s important for their teachers, their parents to bring them to these beautiful sites, let them walk through the rows of crosses, let them look at the walls of remembrance, let them go into the cemetery chapels and let them learn the history of what these men did 100 years ago,” he said. “It’s because of their brave deeds, their acts of valor and courage and commitment … that these young folks are able to live and enjoy the life that they’re living,” he added. During seven weeks of combat, 1.2 million American troops led by Gen. John J. Pershing fought to advance on the entrenched positions held by about 450,000 Germans in the Verdun region. The offensive that started on Sept. 26, 1918, was one of several simultaneous Allied attacks that brought the war which started in 1914 to an end, leading the Germans to retreat and sign the armistice on November 11. At the cemetery, eight wide grave sections with long regular rows of crosses stretch between the trees on the gentle slopes of a hill. On top is a chapel where the names of 954 missing American soldiers, whose bodies were never found or identified, are engraved. Sylvie Corbet reported from Paris.